Chicago Mayor Rahm Emanuel says he is not sorry the city and the state of Illinois didn't offer Amazon more than $2.25 billion to bring its second headquarters to the city. 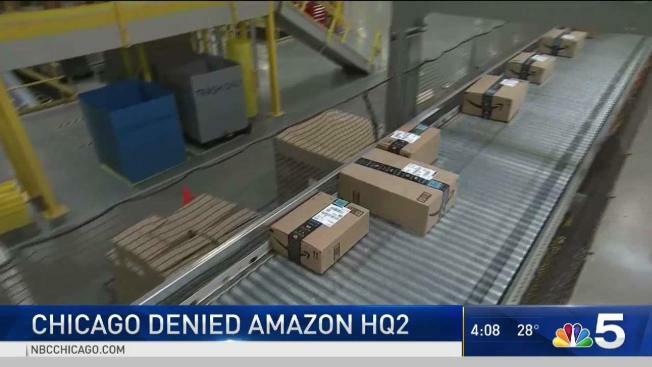 Work continued Tuesday afternoon on one of the sites considered as a possible second headquarters for Amazon as the city acknowledges that the tech giant won’t be setting up shop in Chicago. "You cant win if you don’t compete and you are not guaranteed, just because you compete, that you are going to win," Mayor Rahm Emanuel said. "What I do know is that we have won more than any other city for the last five years." The William Shatner narrated video was part of the Chicago bid, which also included incentives and locations like the main post office, the old Finkl Steel property, the former Michael Reese hospital site and a vacant parcel at Roosevelt and Clark. The winning bidders, promised big incentives, are reportedly $1.5 billion in New York and almost $600 million in Virginia. Chicago and Illinois also reportedly offered up to $2 billion dollars to draw Amazon along with already planned airport improvements and a university fed talent pool that has made the city number one in corporate relocations five years running. "I have been on the phone and I have been moving our staff because we have four companies, as you guy know we have a card, four companies that we have been targeting," Emanuel said. "We have been on the phone and in the next two to three months you will see the product and the success of that strategy." In the meantime, the city says its fundamentals remain strong and companies continue to develop projects like the post office to attract other businesses to Chicago. "We fully expect to be installing tenants by as early as January of 2019," Brian Whiting of the Telos Group said in September 2017.